Rita, B'Shara, Tad, and Cam have a big secret. They can turn into wild animals and use their superpowers to save their city from danger. 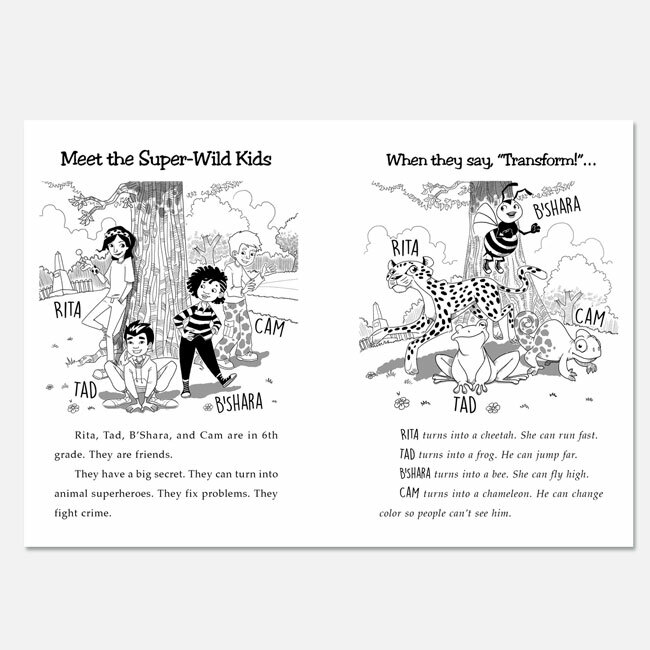 As a cheetah, a bee, a frog, and a chameleon, the four Super-Wild kids do and see things no one else can. 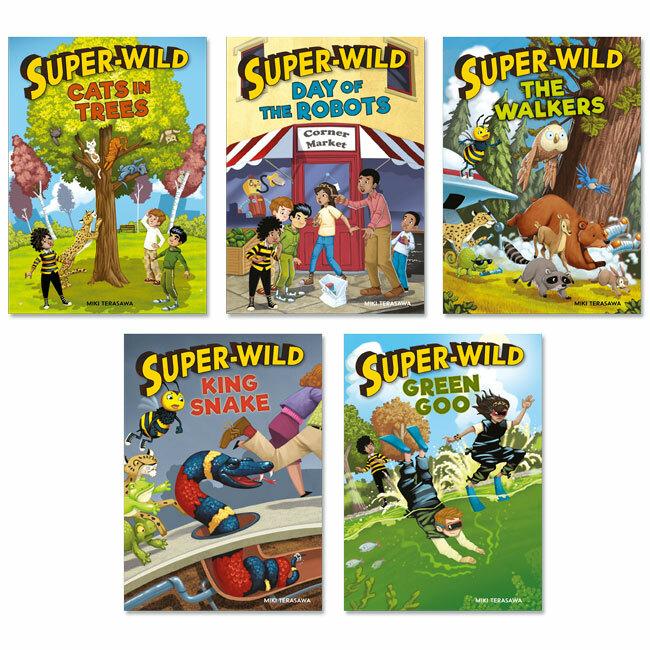 With this series, struggling readers in grades 3 to 6 can use their imagination to follow along with the Super-Wild kids adventures. 95% of the words are from the 950 most commonly used words in the English language, with an emphasis on high-frequency and decodable words. 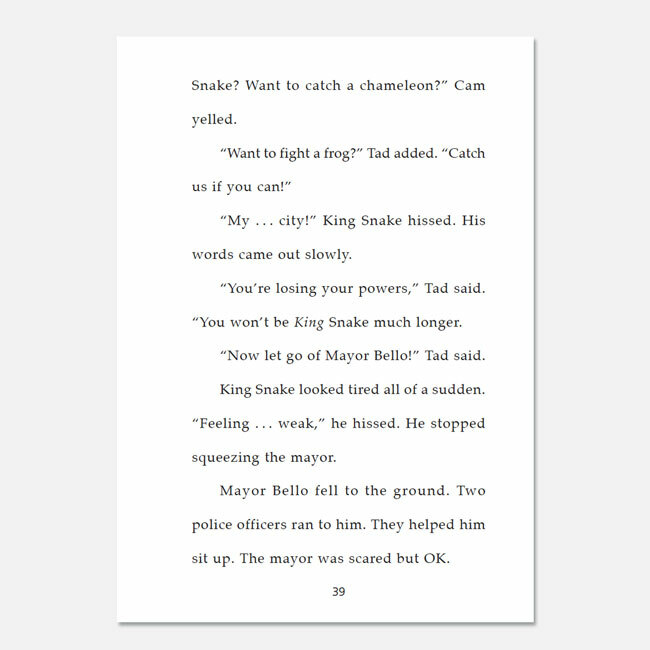 5% of the words are story specific and are defined in context and used multiple times. 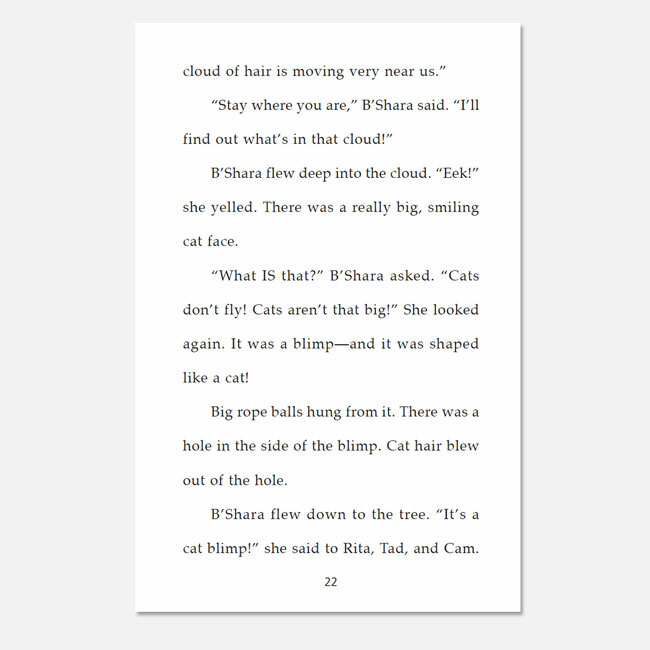 Cohesive text promotes fluency and comprehension. All the cats in the city suddenly climb into the trees. No one can get them to come down. Then they vanish! 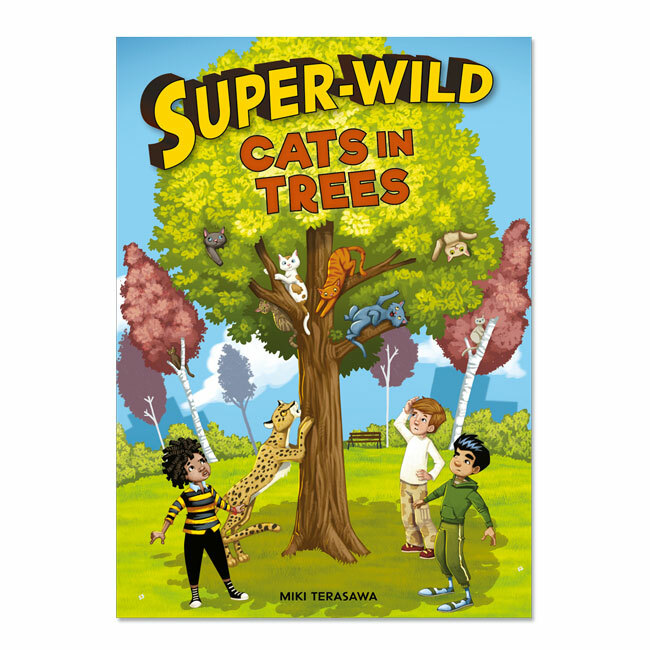 The Super-Wild kids have to find out whos taking the cats, and bring them home. Something is stealing peoples pizza and tacos. Then playground equipment disappears, and something attacks the rides at the amusement park. Its robots! 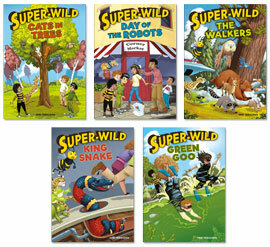 Its up to the Super-Wild kids to stop them! The Super-Wild kids see that all the animals are gone from the park. Then, one by one, B'Shara, Cam, and Tad are taken by strange people walking there. Soon, only Rita is left to rescue them all. She just has to figure out the clues. The city is in danger from a snake that got away from a lab. Now it has superpowers and wants to take over the city. 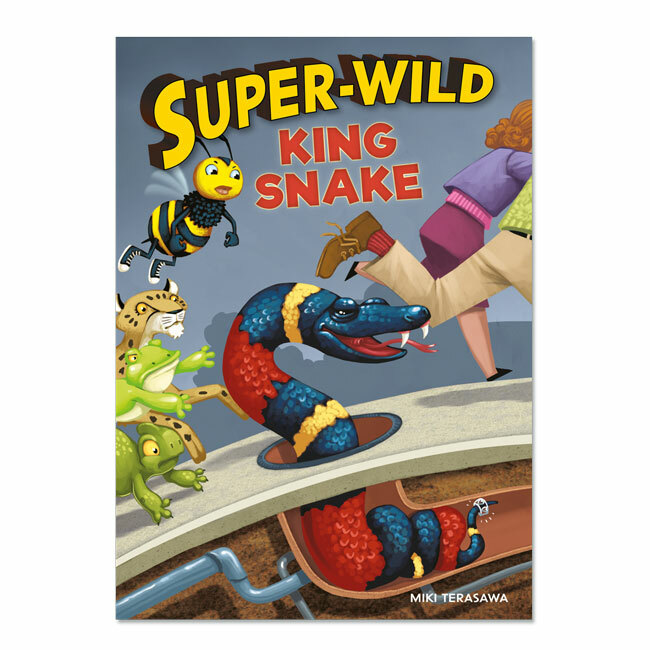 Its up to the Super-Wild kids to track it down and keep people safe from King Snake. A lake in the citys park is covered with sticky green goo. It smells awful, too! What is it from? And where has Tad gone? 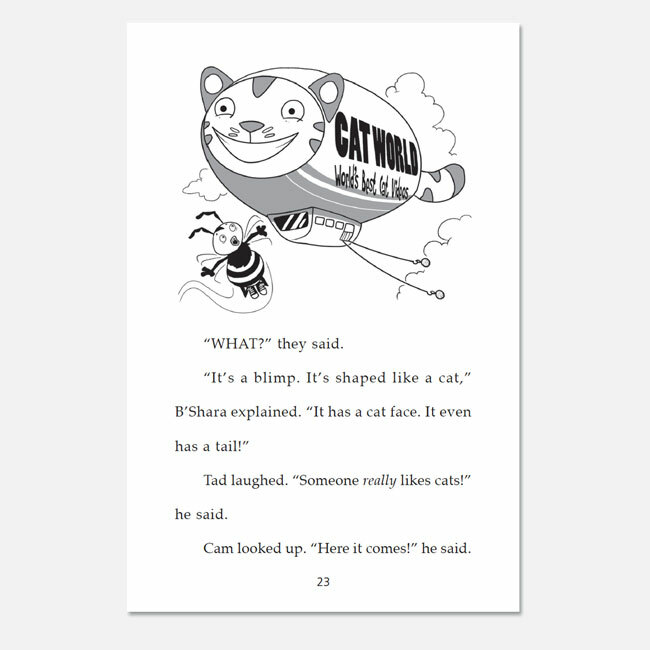 The Super-Wild kids have to find Tad and save him. These high-interest books are wonderful for developing imagination, empathy, fluency, and reading confidence. The mystery style combined with short chapters captivates young readers and builds critical reading skills. I loved that 95% of the words are from the most commonly used words in the English language, with an emphasis on high-frequency and decodable words. This approach is a great way to build reader confidence at such a crucial time in a child's life. 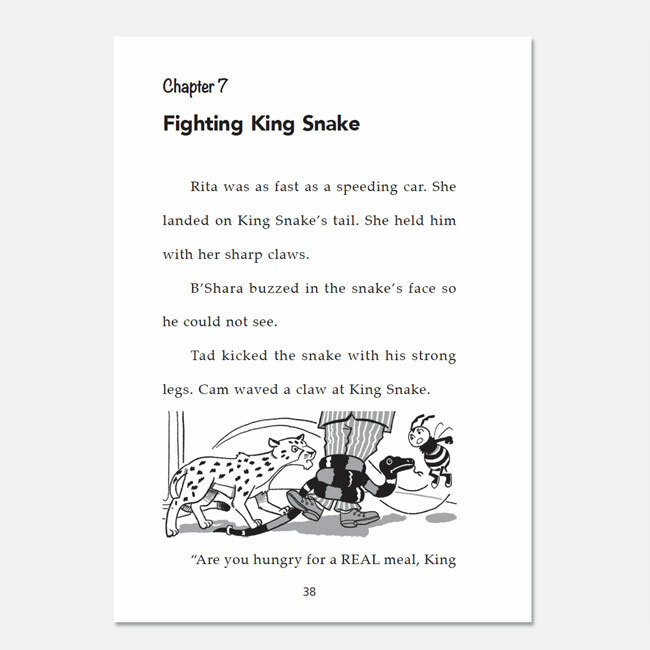 The short chapters are great for children that are ready to be introduced to chapter books.